It was only fitting: Back in May 1980, Laurence Malone wrote the definitive article about Jobst Brandt for Bicycling Magazine. 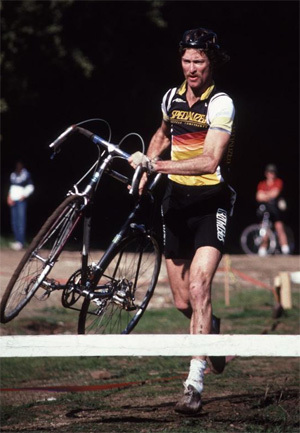 He never rode with Jobst, but as the country’s best cyclocross rider (6-time national champion, counting his Masters 35+ win), he knew exactly what it was all about. It is offered here in its original wording as The Force Who Rides. Laurence lives in Chimayo, New Mexico, where he rides on the area’s miles and miles of dirt roads. You can learn more about him by reading Cyclocross Magazine. This entry was posted on September 30, 2014 at 6:57 pm and is filed under News. You can follow any responses to this entry through the RSS 2.0 feed. You can leave a response, or trackback from your own site. I didn’t even know you could “Reblog” on WordPress, but since my blog is moribund, I could do a lot worse than to repost an article about the legendary Jobst Brandt by the also-legendary Laurence Malone. From the legendary blog of Ray Hosler! I’d heard of this article before, but hadn’t read it in its entirety. Thanks for sharing it, Ray! Those Jobst rides must have been a blast. I met Jobst only once–when I witnessed him building a wheel in a class/lecture at PA Bicycles about 1985. I have a signed copy of his book from that night. I never tried building a wheel but I still stress test my wheels by grabbing spokes and squeezing the way he suggested to us: “Don’t worry, if you break anything with your hands it was going to break on a ride anyway”. His book also made me appreciate what an engineering marvel a bicycle wheel is. I like the fact that he was a touring cyclist (par excellence) who was not really interested in racing. In my view, too many people think you’re not really serious unless you race. I was never very competitive in sports anyway and cycle touring ended up being a great outlet for me over the past three decades. I feel bad that WordPress’s automatic “reblog” copied your whole post. This isn’t Tumblr, there are rules! In any case, thank you for unearthing this! Thanks Ray, for making some cool pre-internet history readily available. Having ridden an raced with the riders mentioned, I enjoy the local perspective as well.